MC Who is a Salt Lake City hip hop artist with a raw, old-school style that allows him to stand out in the current trap-heavy and producer-focused scene. Now, you may be wondering, “What makes MC Who so mysterious?” Well, while doing research for this review, I discovered that MC Who appears to have no Soundcloud, Bandcamp, Twitter, Instagram, etc. I find this odd in a world where your brand seems to be everything— and showing up in SEO is some of the best marketing you can get. So Many Faces as a title couldn’t describe this album more perfectly, as MC Who hits so many tempos and styles throughout these 13 songs. So Many Faces starts with “Won’t Go,” a slower-tempo track with a simple kick drum beat and piano backing. MC Who’s delivery on this track is one of the smoothest on the album, and the guitar picking during the chorus work well together. Further through the album is “Allegory,” which just sounds like the vocals and beat are competing for my attention and it’s too busy. Between the four or so string samples, timing of the beat and the vocal delivery, there is way too much going on. A few songs later is “Eye Sockets,” which aside from the chorus, sounds like MC Who is trying out an Eminem impression. As I listen to So Many Faces, there are a few interludes/skits and I must say, I think they are the highlight for me, track wise. They breakup the album a bit and have some fun experimental bits in them that I could see MC Who building off of in the future. 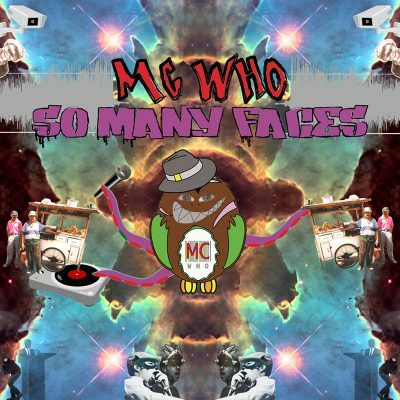 You can listen to So Many Faces and more by MC Who at https://mcwho.bandcamp.com/.